The Hürtgen Forest occupies a rugged area between the Rur river and Aachen. The dense conifer forest is broken by few roads, tracks and firebreaks; vehicular movement is restricted. In the autumn and early winter of 1944, the weather was cold and wet and often prevented air support. Ground conditions varied from wet to snow cover. The German defenders had prepared the area with blockhouses, minefields, barbed wire, and booby-traps, hidden by the snow. Also there were numerous bunkers in the area, mostly belonging to the deep defenses of the Westwall, which were also centers of resistance. 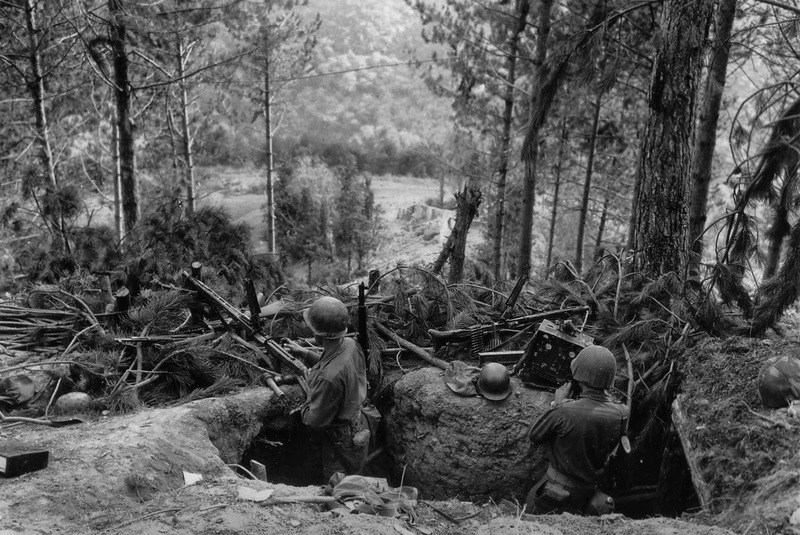 The dense forest allowed infiltration and flanking attacks and it was sometimes difficult to establish a front line or to be confident that an area had been cleared of the enemy. The small numbers of routes and clearings had also allowed German machine-gun, mortar and artillery teams to pre-range their weapons and fire accurately. Apart from the bad and very cold weather, the dense forest and rough terrain also prevented proper use of the Allied air superiority which had great difficulties in spotting any targets. The American advantage in numbers (as high as 5:1), armor, mobility, and air support was greatly reduced by weather and terrain. In the forest, relatively small numbers of determined and prepared defenders could be highly effective. As the American divisions took casualties, inexperienced recruits were brought up to the front as replacements. 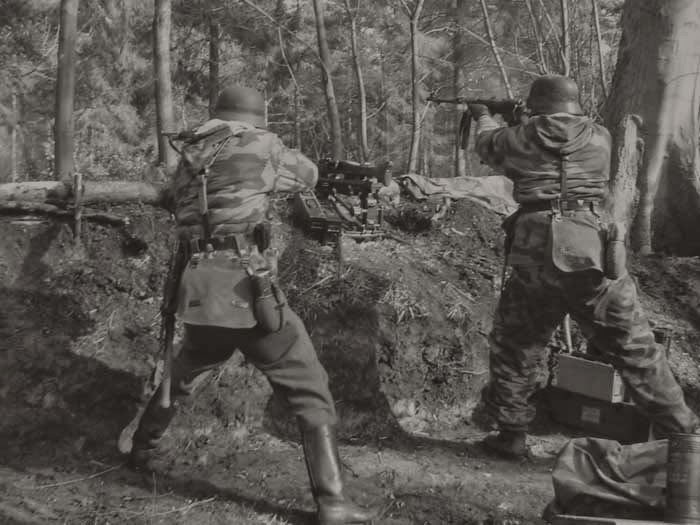 The impenetrable forest also limited the use of tanks and hid anti-tank teams equipped with panzerfausts . Improvised rocket launchers were made using rocket tubes from aircraft and spare jeep trailers. 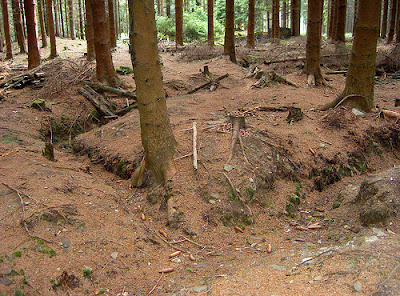 Later in the battle, it proved necessary to blast tank routes through the forest. Transport was similarly limited by the lack of routes: at critical times, it proved difficult to reinforce or supply front-line units or to evacuate their wounded. The Germans were hampered by much the same difficulties, of course; their divisions had taken heavy losses on the retreat through France and were hastily filled up with untrained boys, men unfit for service, and old men. Transport was also a problem because of the difficult roads and the lack of trucks and fuel. Most supplies had to be manhandled to the front line. But the German defenders had the advantage in that their commanders and many of their soldiers had been fighting for a few years and had learned the necessary tactics for fighting efficiently in winter and forested areas, whereas the Americans were often well-trained but inexperienced. The tall forest canopy also favored the defenders. Artillery fire was fused to detonate as tree bursts. While defenders were protected from shell fragments (and wooden splinters from the trees) by their dug-in defensive positions, attackers in the open were much more vulnerable. 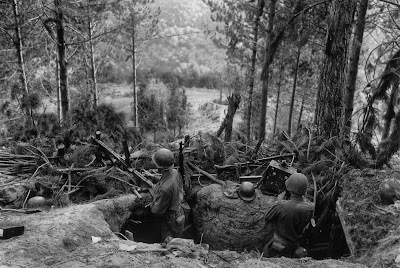 Conversely, U.S. mortar platoons needed clearings in which to work; these were few and dangerous, being pre-ranged by German troops, so mortar support was often unavailable to rifle platoons. 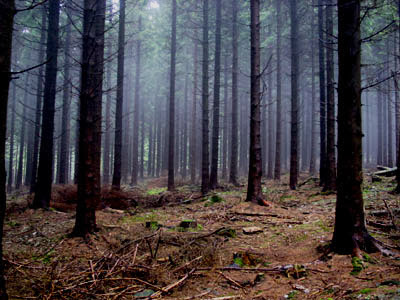 Walked much of this forest in the 1980’s and it is haunted! No not like your average 12 year old thinks about haunting. Unlike Normandy and Bastogne where every American is carted on tour buses the Hurtgen is something special. This battle is key for two main reasons. The US Army ignored the basic principles of war and thought that men, material, and airpower would work. They were wrong. It also shows that a determined fighter standing on home turf can multiply their combat effectiveness. Visit here if you can and walk the Kall trail.